As part of promotion of evidence-based policy making, decision makers and researchers have applied a wide range of modelling to evaluate the effectiveness of food security programs. One widely applied model is a multi-country computable general equilibrium model or known as the GTAP. 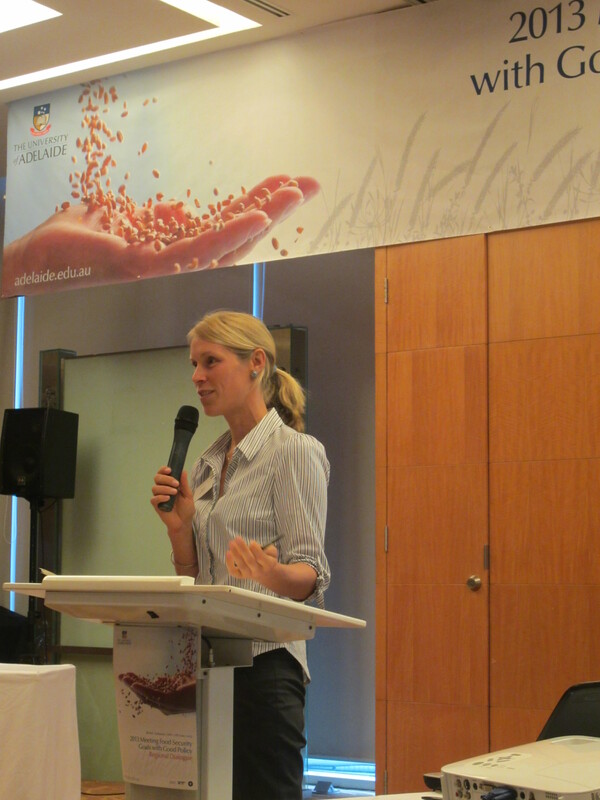 Anna Strutt (University of Waikato) and Signe Nelgen (University of Adelaide) shared their work entitled “Food security scenarios for the Asia Pacific – inter-sectoral and inter-economy perspectives”. Strutt and Nelgen’s study focuses on CIPTTV countries, namely China, Indonesia, Philippines, Chinese Taipei and Viet Nam aiming to capture the impact of potential policy changes and other external shocks. The study uses an economy-wide framework using a computable general equilibrium model, a global trade model GTAP. Some important features of the modelling include: attention is given to the structural detail of the economy and inter-relationships between sectors; Prices and quantities are determined simultaneously with markets usually are assumed to clear; Incomes are endogenously determined; There is optimising behaviour by consumers and producers, with prices inducing adjustment. The CGE model imposes constraints e.g. availability of factors of production. 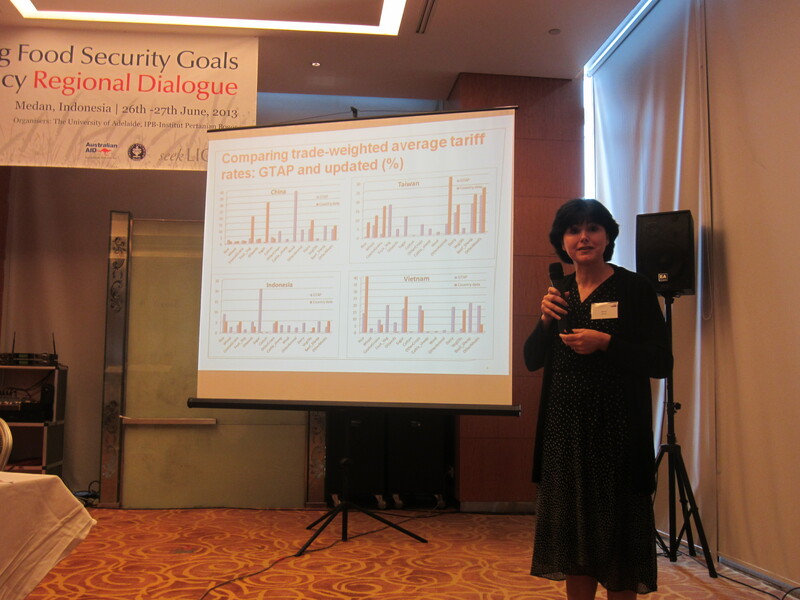 The GTAP model and the latest available GTAP version 8.1 data base with a base year of 2007 for 134 countries/regions and 57 sectors are used. Aggregation is implemented to derive 25 sectors and 28 regions in the study. The data are first projected to 2015. Agricultural distortions by Anderson and Valenzuela (2008) are updated and mapped to the GTAP sectors. Bilateral preferences from the GTAP database are maintained. To better capture food security aspects, the study augments the GTAP with food nutrition data using kilocalories per day per person. Five scenarios are being simulated for the CIPTTV region: 1) improved agricultural productivity (land consolidation may lead to a 5 per cent increase in TFP in land-using sectors; 2) increased rice self-sufficiency through increasing tariffs imposed on imports from all regions thus eliminating 99 per cent of rice imports; 3) Combination of 1) and 2); 4) increased rice self-sufficiency and retaliatory tariffs from a key rice exporter; and 5) natural disaster harming land productivity which is assumed to lead to a 5 per cent reduction in land productivity in the region. The study concludes that policies to promote self-sufficiency through the use of protectionist trade policies such as tariff may lead to a worsening of key food security indicators such as household food consumption. But if agricultural productivity improvements are part of the policy mix, the impacts will be less severe. However, retaliatory trade policies are likely to worsen conditions.